Research and advocacy groups are exploring ways to restore access to the more than 800,000 cases that were recently removed from PACER, the electronic search and retrieval system for federal court documents. It is a task made all the more difficult since the records were taken down without public notice or consultation. With advanced notice, groups seeking to compile and make available federal court documents could have focused on the records that were targeted for removal, said Brian Carver, an assistant professor at the University of California at Berkeley School of Information and director of the Free Law Project. The Free Law Project and Princeton University have teamed up to create RECAP the Law, a browser extension that captures documents downloaded from PACER (at the standard 10 cents-a-page rate) and then makes them available for free on the Web. Carver is now part of a group spearheaded by Public.Resource.Org that has written to the chief judges of the five affected courts requesting access to digital copies of the records so that they can be made available. Other efforts are underway as well. Holly M. Riccio, president of the American Association of Law Libraries, said the AALL government relations staff has been in discussions with the Administrative Office of the U.S. Courts to advocate for restoration of the documents, to learn about additional changes that may be coming to PACER, and to encourage a more consultative approach to any future changes to the system. The changes took place on either Aug. 10 or 11. The announcement of the change went up at the same time the documents were removed, an AOUSC spokesperson said. Concerns about the missing cases began to surface last week. AOUSC spokesman Charles Hall said that the documents were removed because upgrades to PACER are incompatible with the record management systems of a handful of courts. He said that only about 800,000 cases out of more 33 million were affected. He added that all the cases removed are closed, and that the majority come from a single court, the California Central Bankruptcy Court. But as the BBC pointed out, some of the affected cases are of significant historical interest, including Ricci v DeStefano, a high-profile racial discrimination case heard on appeal by Sonia Sotomayor – now a Supreme Court Justice – when she was on the Second Circuit Court of Appeals. All Second Circuit Court of Appeals cases filed prior to 2010 are among those removed by the courts from PACER. 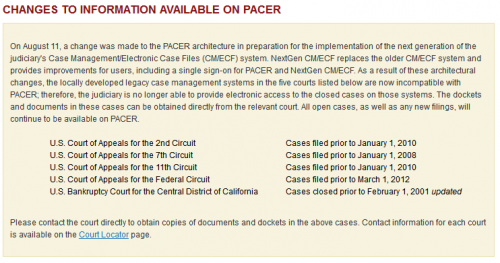 The notice posted to PACER about the removed cases. Another spokesperson for AOUSC said she was unaware of how many actual documents or pages are associated with the 800,000 affected cases. She added that the cases were not “deleted,” just taken offline, which gives hope to Berkeley’s Carver that the documents can be put back online, if not by the courts, then by groups like the Free Law Project and Public.Resource.Org. AALL’s Riccio said that the fact that the affected cases are all closed does not make researchers feel better about the change. David Mao, the law librarian for the Library of Congress, agreed. Carver said that the situation is made worse by the fact that there is no list of cases affected, and that when you search for a case that has been removed, no results are returned. The documents are still accessible from the individual courts, but it’s a laborious and expensive process to get them, as outlined in this post from Professor Leslie A. Street at the University of North Carolina School of Law. Along with being an extremely helpful guide to how to obtain these documents, Street’s post reveals that the clerks in at least one of the affected courts were unaware that their documents had been removed from PACER. Hall, the AOUSC spokesman, said his office is still trying to get a handle on other changes that will be coming to PACER as a result of the upgrade. One enhancement he thinks users will like is that they will no longer have to login separately to each district court to search for that court’s documents. Rather, they will stay logged in as they navigate from court to court. Riccio said, as a practical matter, that particular enhancement may not be that useful. She said she normally searches all courts instead of specific courts, and that most browsers remember login information, so signing in again is fast and easy. One enhancement she’d like to see in PACER is the ability to search by judge, in addition to fields like defendant’s name and case number that already exist. “We’re just hopeful that moving forward, there will be more notice and more collaboration, and that the courts will seek input from a variety of users when making decisions that affect those users,” Riccio said. The FOIA Project itself is a heavy user of PACER. Computer experts at the Transactional Records Access Clearinghouse at Syracuse University, one of the FOIA Project partners, has developed algorithms that identify FOIA cases in PACER and allows the Project to pull the cases into our Case Search mechanism, which contains the dockets and other documents for more than 5,000 FOIA cases. Many services use PACER in this way, developing programs to identify cases of interest, adding value to those records in some way, and making them available for free (as the FOIA Project does) or as part of a subscription service. Another unknown about the changes to the PACER architecture is whether those changes will force organizations’ to alter the underlying mechanisms they use to collect information from PACER. * Here’s an editorial on the changes from The News Herold of Panama City, Fla.
Want to add your thoughts to this discussion? Please comment below, share your thoughts on our Facebook page, Tweet at us @foiaproject, or email gjmunno@syr.edu.